I recently had the opportunity to enjoy a Kurobuta tonkatsu at a pretty authentic Japanese joint (Tonkatsu Ginza Bairin) that serves tonkatsu almost exclusively, ten different ways. The dish set me back $35 which was at first unsettling - but I considered how many times I've spent that much or more on a fine steak and I thought to myself, why shouldn't the pig deserve as much as the cow? The story goes that British traders were closed off from Japan until the 1800's when they brought over some Berkshire pigs. The Shogun prized them so much that they agreed to trade as long as they brought more of those "Black Pigs" - or "Kurobuta" in Japanese - each time they returned. What a great story right? Unfortunately, I can't find anything even remotely credible to confirm or deny it, but it continues to perpetuate out of sheer romance. Nevertheless, the "Black Pig" has more marbling, a more ruddy flesh (some call it "the other red meat"), and much more flavor than your supermarket variety pig. This "leaning" of America's pigs; however, was largely done on purpose. The market desired less fat and according to Dr. Grant Walling on thepigsite.com, the lean % of our pork has increased by more than 37% since the 1960's. I've already alluded to the National Pork Board's slogan, "The Other White Meat," which was so successful that in 2000 that a survey by Northwestern University found it to be one of the five most memorable taglines in contemporary advertising. Before we were served, my Kurobuta tonkatsu began with a mortar and pestle to grind up some sesame seeds fresh. To this paste, we added some of their homemade katsu sauce, and for me, a dab of hot mustard on each bite. My cutlet had a thick piece of fat, one inch in places, running down one side and my immediate American reaction was to trim it. I didn't, and found it do be soft like a marshmallow and tasting of the essence of delicious. Cleansing your palate with sake is a "must do"
The panko added a toasty aroma, a sharp crispness, and plenty of craggles for the sauce to gain a firm grasp on. Between bites I would eat either some plain white rice, some cabbage, or drink some sake to clear my palate - trying my best to enjoy the next morsel like it was my first. Their sauce is amazing, like a soy based sweet and sour, it was thickened possibly with molasses or malt extract. 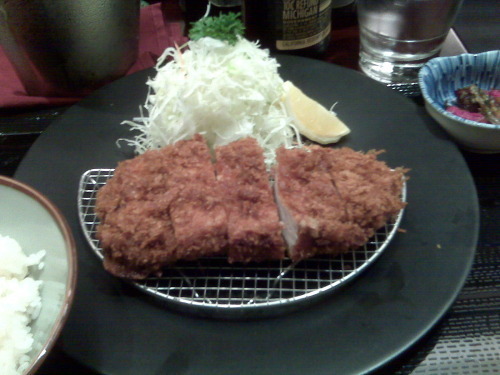 When we do Kurobuta tonkatsu at home, I will enjoy trying to replicate this. My wife didn't opt for the Kurobuta but she got Katsudon instead which is tonkatsu served over a bowl of rice with a fried egg on top. It was unbelieveably rich and [because the grass is always greener...] I preferred her dish over mine. 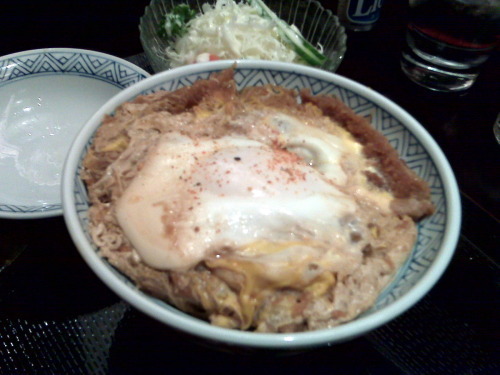 The next time I'm in a katsu shop, I'm going for the Katsudon. Kurobuta pork is my new favorite breed of swine. Which honestly, wasn't difficult to move into that spot because hitherto, I couldn't even name another. Now, with a burgeoning demographic of savvy consumers, fat is hip, and Kurobuta pork delivers. In fact, you can have Kurobuta delivered. If we can't find Kurobuta locally, we're going to mail order some. Here are some of the vendors I found.